Today we honor a very special dinosaur. A dinosaur that not only has roots in New Jersey, but holds significance to American paleontology as a whole. Enter Hadrosaurus foulkii! Hadrosaurus was a plant-eating dinosaur that lived in what is now New Jersey, USA, during the Late Cretaceous about 79 million years ago. It is known from the majority of a skeleton, minus the skull (bummer), and would have been about twenty five feet long from beak to tail. Since it was the first of its kind to be discovered, Hadrosaurus' name is used as the family name, hadrosauridae, for the entire group of duckbill-dinosaurs, like Anatotitan, Maiasaura, Parasaurolophus, and Tsintaosaurus. Its genus name translates to "Bulky Lizard" and the species name is in honor of William Parker Foulke, who took part in its discovery. Life reconstruction of Hadrosaurus foulkii by Christopher DiPiazza. 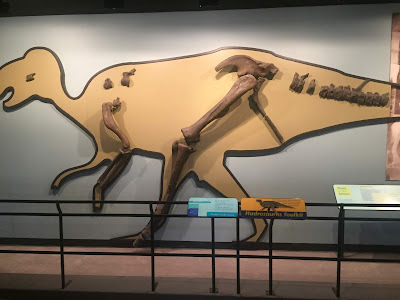 Hadrosaurus is a very important dinosaur not just because it was found in New Jersey, but because it was actually the first scientifically recognized dinosaur ever dug up in all of the United States! This dinosaur's bones were found in what is now Haddonfield, New Jersey, in 1838. The man who discovered the first of its bones actually used them as decorations on his house until they were noticed by William Parker Foulke. Foulke was intrigued by these bones and ended up digging out more of them from where the original specimens were unearthed. Paleontologist, Joseph Leidy, correctly identified the bones as belonging to a dinosaur because of their similarity to those of Iguanodon, which had been discovered during the 1820s in England. Known skeleton of Hadrosaurus foulkii on display at the Academy of Natural Sciences in Philadelphia, PA. 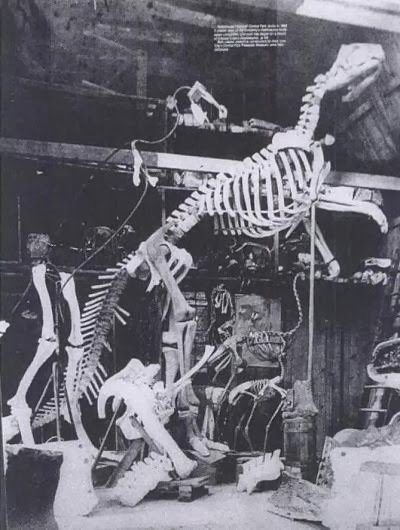 In 1868, a skeletal mount of Hadrosaurus was erected at the Philadelphia Academy of Natural Sciences, making it the first dinosaur skeleton to be mounted in the world. Since the skull was never found, a skull was sculpted based somewhat on modern iguanas, since dinosaurs were thought to be more closely related to lizards during that time, given the little information that was known. It was also, however, posed standing on its hind legs which was previously unheard of for reptiles, let alone dinosaurs. 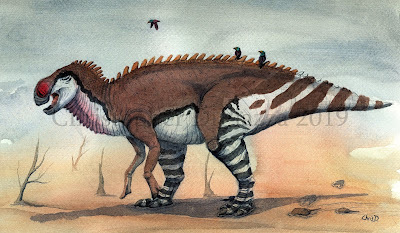 We now know that Hadrosaurus would have definitely been able to stand and walk on its hind limbs and despite the fact that a skull was never actually found, it almost certainly had a broad, flattened beak of some sort like the rest of its hadrosaur kin. 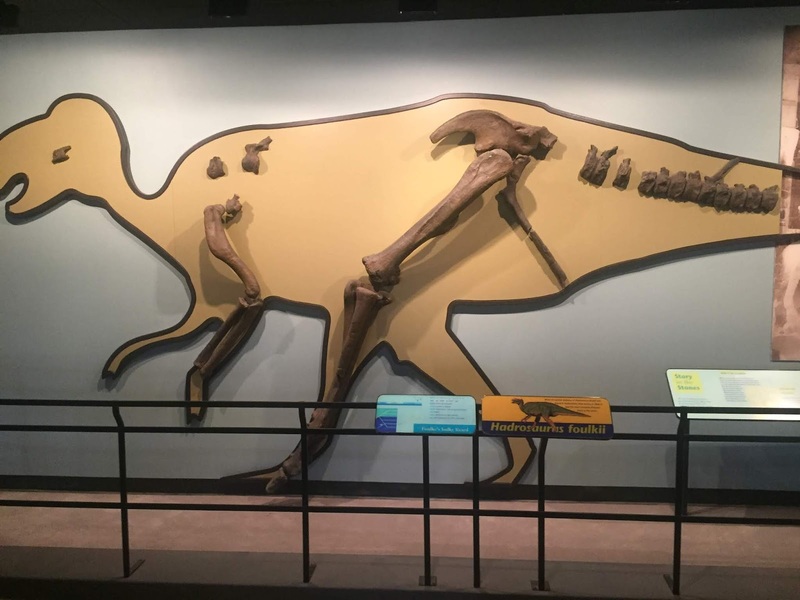 Photograph of the original Hadrosaurus skeletal mount. Note the lizard-like skull. 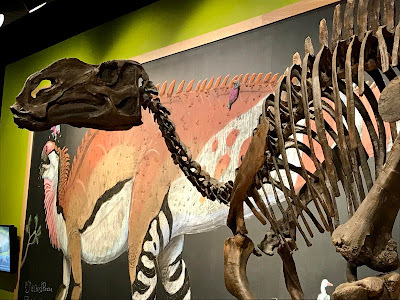 Exactly how the beak and the shape Hadrosaurus' skull would have looked is somewhat of a mystery, but according to the most recent studies done on the hadrosaurid family, Hadrosaurus appears to be one of the more basal of the "true duck-billed" dinosaurs, called the hadrosaurines. 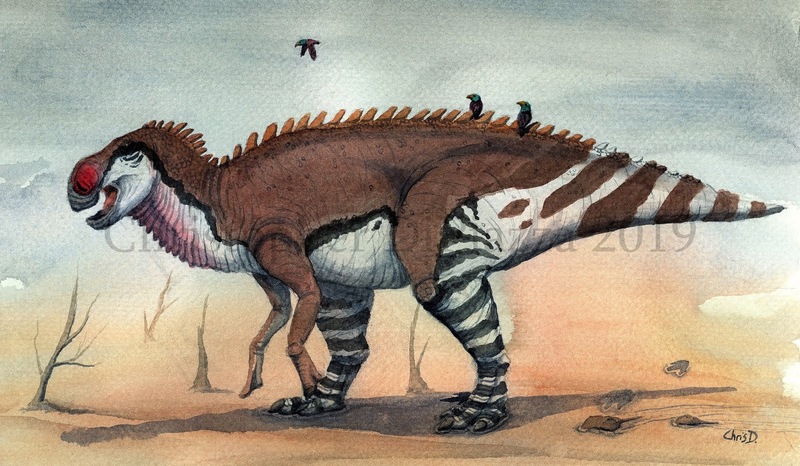 This means that it was less related to the lambeosaurine hadrosaurs, which are known for having elaborate crests, like Parasaurolophus, and was closer to the more broad-billed hadrosaurs, like Edmontosaurus. The dinosaurs most closely related Hadrosaurus within this group have slightly downturned snouts, like that of Maiasaura, which lived a few million years after Hadrosaurus, so Hadrosaurus' skull may have looked similar. Hadrosaurus skeletal mount on display at the Academy of Natural Sciences. Skull is a cast of a relative, Maiasaura. When the subject of paleontology comes up in a casual conversation (because when you hang out with dorks like me it does a lot) most envision people digging in deserts out west in states like Utah, New Mexico, or the Dakotas. While this is true in a lot of cases, ground zero for American dinosaur fossil sites is actually in a wooded area in little old New Jersey. Because of this, New Jersey was the first state to give itself an official state fossil, Hadrosaurus. This means that we have two state dinosaurs, because our state bird, the Goldfinch, is a dinosaur...because birds are dinosaurs. Gallagher, W.B. (2005). "Recent mosasaur discoveries from New Jersey and Delaware, USA: stratigraphy, taphonomy and implications for mosasaur extinction." Netherlands Journal of Geosciences, 84(3): 241. Prieto-Márquez, A. (2011). "Revised diagnoses of Hadrosaurus foulkii Leidy, 1858 (the type genus and species of Hadrosauridae Cope, 1869) and Claosaurus agilis Marsh, 1872 (Dinosauria: Ornithopoda) from the Late Cretaceous of North America". Zootaxa 2765: 61–68. Prieto-Marquez, A., Weishampel, D.B. and Horner, J.R. (2006). "The dinosaur Hadrosaurus foulkii, from the Campanian of the East Coast of North America, with a reevaluation of the genus." Acta Palaeontologica Polonica, 51(1): 77–98. Xing, Hai, et al. “Supplementary Cranial Description of the Types of Edmontosaurus Regalis (Ornithischia: Hadrosauridae), with Comments on the Phylogenetics and Biogeography of Hadrosaurinae.” Plos One, vol. 12, no. 4, 2017, doi:10.1371/journal.pone.0175253. 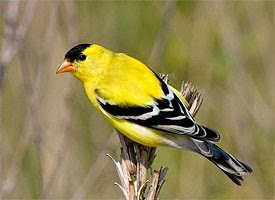 Hey, the Gold Finch is the State Bird of Iowa Too. I guess it would count as our State Dinosaur as well, since Iowa is not known for Dinosaur bones.